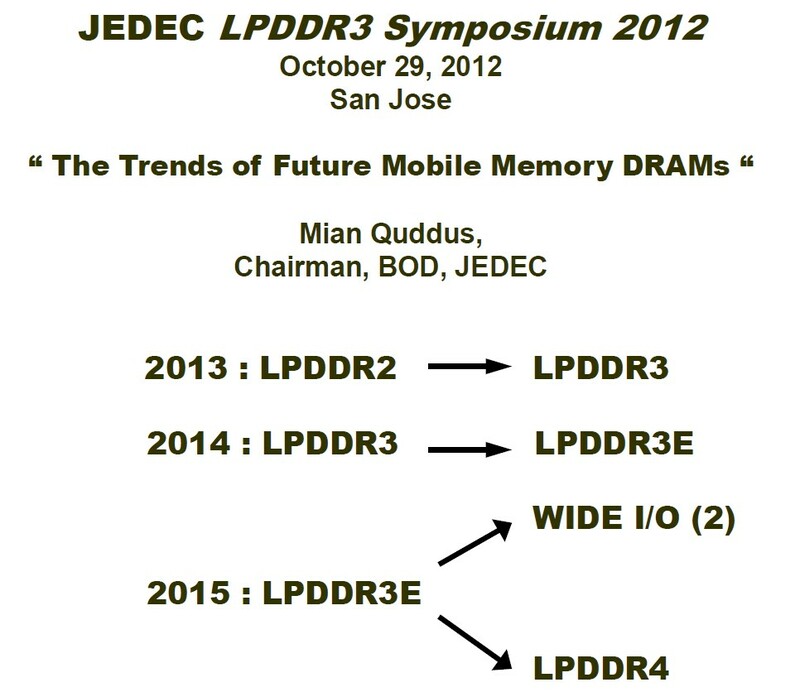 speakers, Dr. Subramanian S. Iyer of IBM, Dr. Takeshi Uenoyama of Panasonic, and Dr. Urmi Ray of Qualcomm. General Chair was Shintao Yamamichi of Renesas and Technical program Chair was Hitoshi Sakamoto was NEC. There were 180 papers and over 20 posters. Major topics were: Advanced Packaging, Substrate & Interposer, 2.5D and 3DIC Packaging, Design/Modeling/Reliability, Thermal Management, Materials and Process, Printed Electronics, N-MEMS, Optoelectronics, Power Devices, and Biomimetics. In addition, the Japan ASET consortium, Taiwan and Korea held special sessions. IFTLE will cover key presentations over the next few weeks. Lets first take a look at the ASET special session. 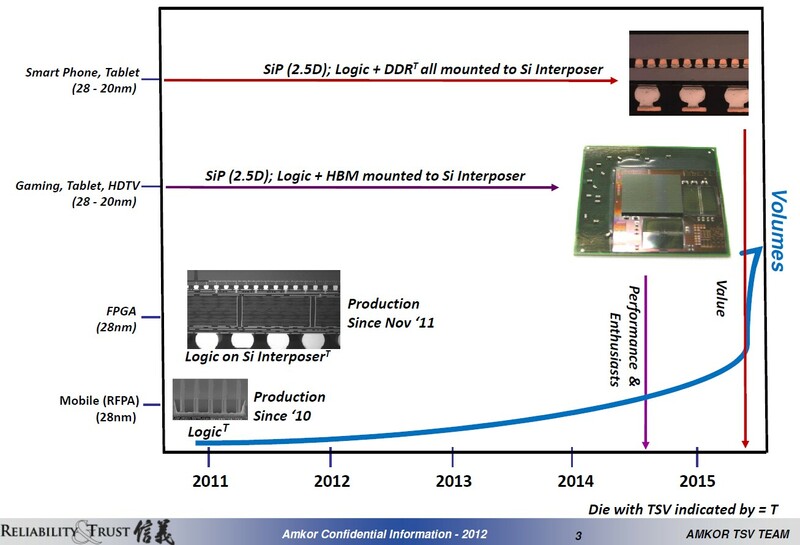 The ASET “Dream Chip” program has recently ended in Japan. 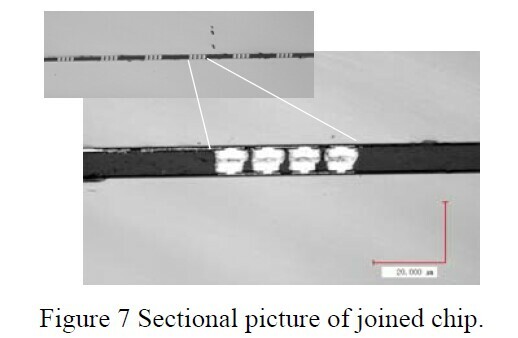 The were able to bond 10um pitch bumps (see figure) using a flip chip bonder equipped with infrared alignment optics they found that they could observe alignment marks and adjust the chip position during the bonding process, even when the solder was molten. Most importantly they could eliminate the miss-alignment caused by joining non flat chips an due to thermal expansion of the tool head. (4) final align during the bonding while the solder is molten. 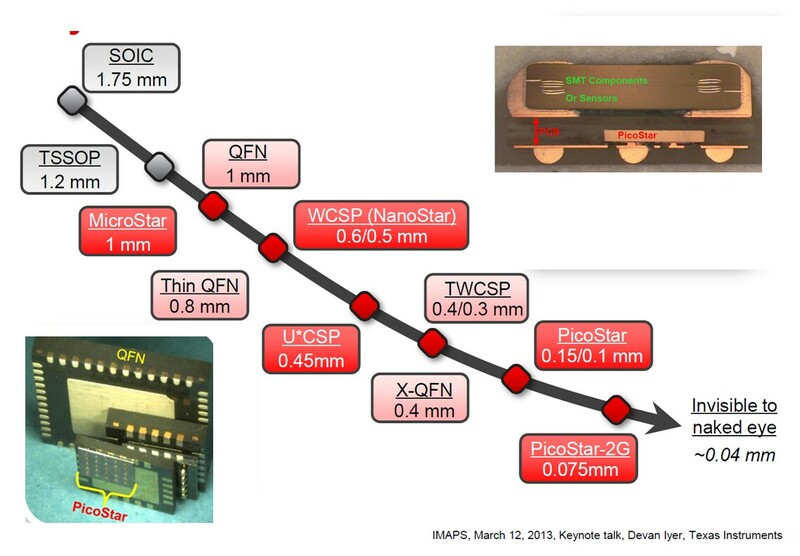 Renesas and IBM Japan described “3D Package Assembly Development with the use of Dicing Tape Having NCF Layer”. Dicing and stacking are important technologies n 3DIC assembly. Bumps on the wafer backside make it difficult for general dicing tape to achieve both high quality dicing and pickup. 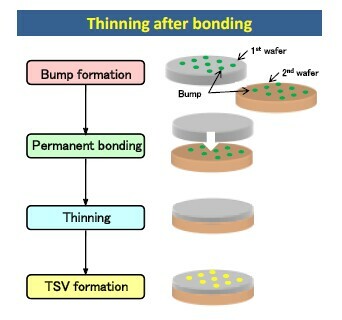 For tight pitch, small bump bonding it is also difficult to inject underfill into the narrow gap between the dies. General dicing tape cannot burry the bumps and thus fully fix the die. This causes chipping and cracking of the die during dicing. If you increase the tapes thickness to fully burry the bumps, die pickup becomes difficult. 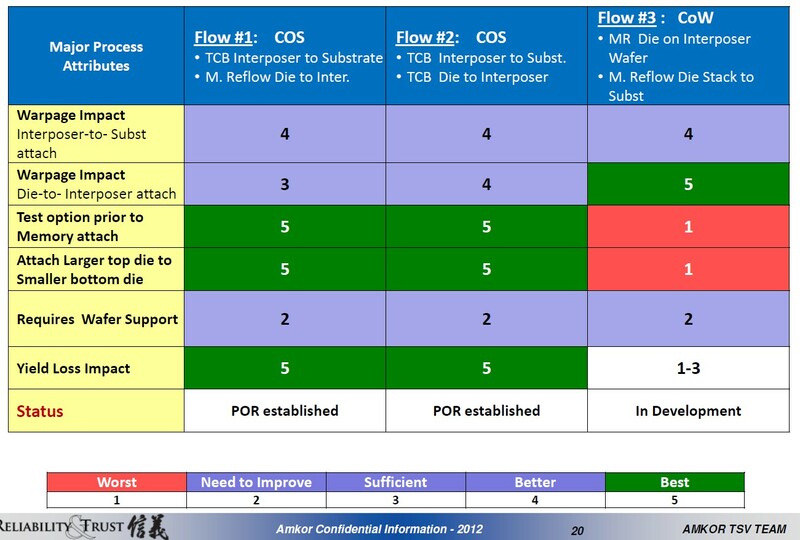 Process flow is shown below. 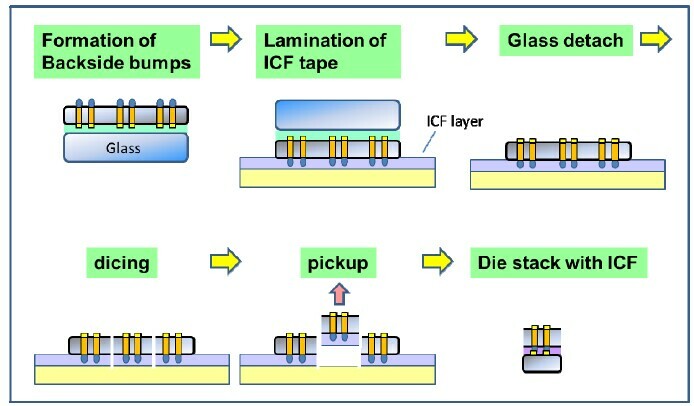 ASET studied a new ICF tape from Nitto Denko. The tape has a NCF layer (non conductive film) on the dicing tape. Since this NCF layer ends up staying in the gap as underfill, they call this Inner chip film or ICF (just what we need more acronyms !) Hot lamination of the tape to the wafer will burry the backside bump. 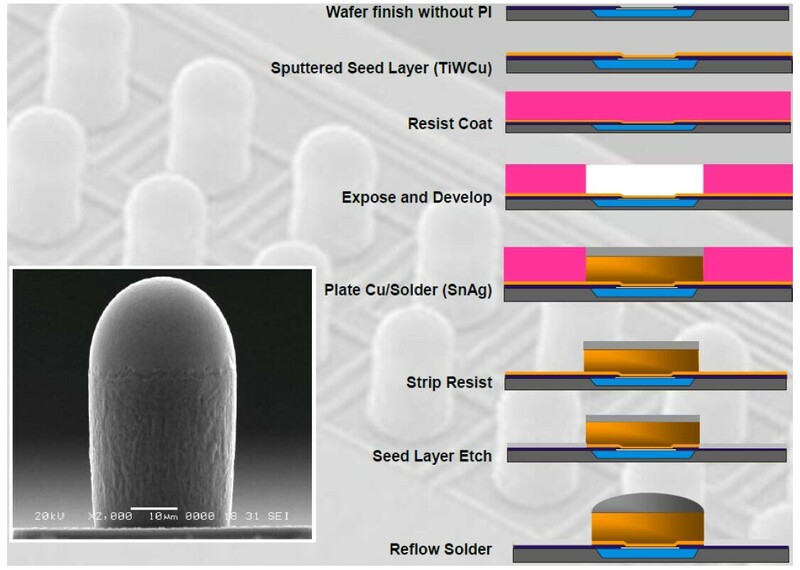 Wafer and NCF layer are diced together. The die pick up becomes easy since the required separation is between the ICF and the dicing tape adhesive. The new process using ICF tape is shown below. 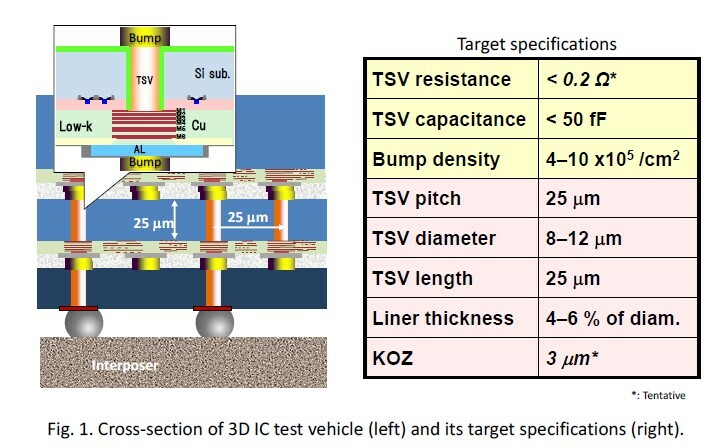 Hozawa and ASET co-workers at ASET described their “3D Integration Technology using Hybrid Wafer Bonding and its Electrical Characteristics”. 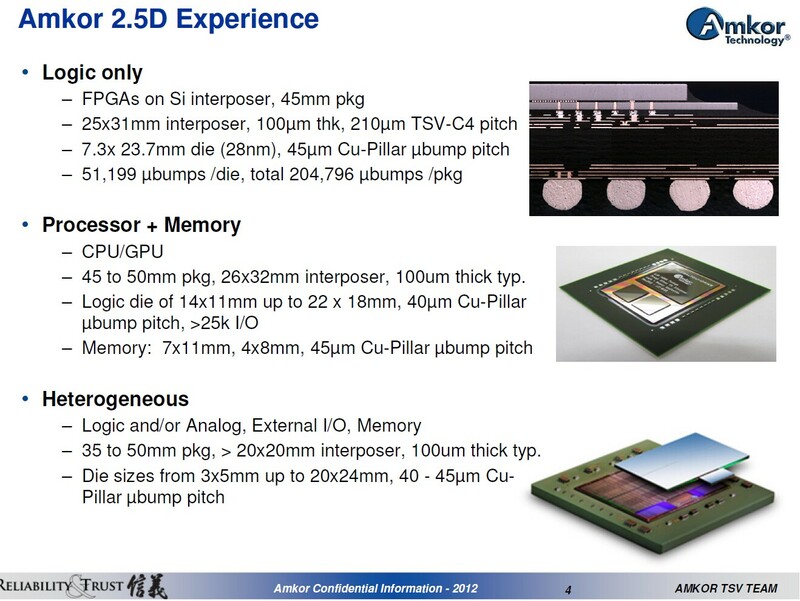 In this study ASET examined 3D integration with vias last. 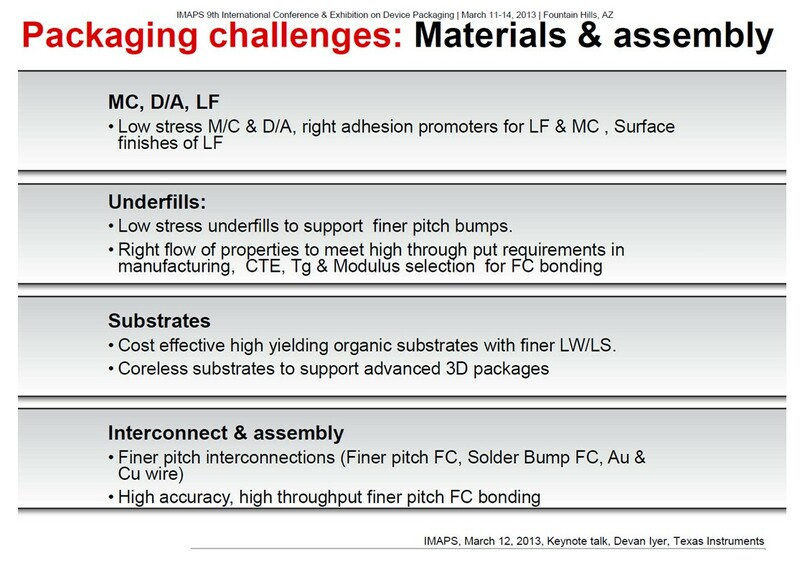 Vias last was examined because it needs no modification of the front end process. The test structure and target specs are shown below. The process flow consists of: TSV formation; bump/contact ad formation; substrate thinning and stacking. They examined W2W bonding and thinning after bonding as process flows. 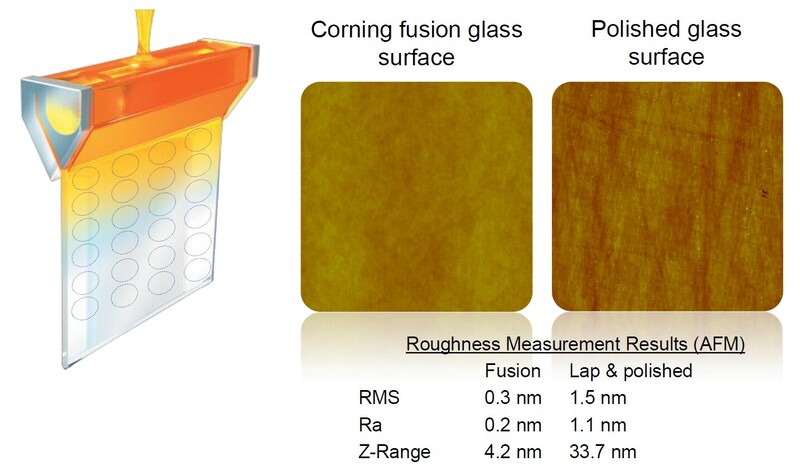 Hybrid bonding was chosen where Cu-Cu and polymer – polymer bonding (they used PBO) occur at the same interface. Hybrid bonding provides both strong metal bonding and reliable polymer underfilling simultaneously. 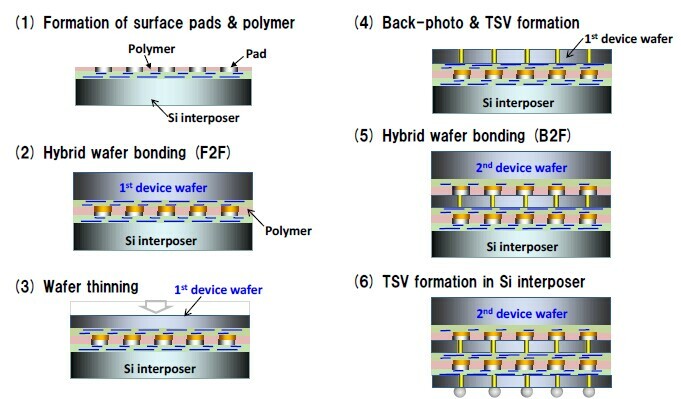 In the full process sequence a silicon interposer wafer and the first device wafer are bonded F2F with hybrid bonding. 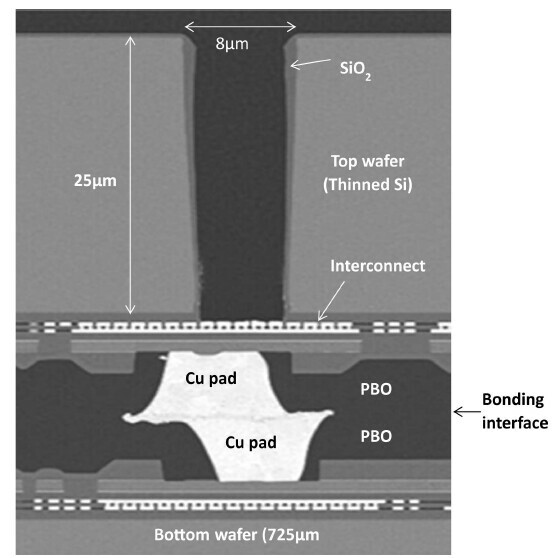 After backside thinning the first device wafer, TSV formation and backside bumping the second device wafer is bonded to the stack B2F. Lastly the silicon interposer is thinned, TSV formed and bumps attached. To achieve good CU-Cu bonding in the hybrid bonding “hydrogen radical” treatment of the Cu surface was necessary. When they tried plasma treatment it damages the PBO surface. A cross section of the interface is shown below. For all the latest on 3DIC and advanced packaging stay linked to IFTLEâ??¦â??¦â??¦â??¦â??¦â??¦â??¦â??¦.. The undisputed Jewel of IC packaging conferences, the ECTC (Electronic Component Technology Conference) took place this past week in Las Vegas with 1300+ attendees, 95 exhibitors and IFTLE in attendance. Over 600 submitted abstracts resulted in ~300 presentations (verbal and poster) and the highest rejection rate in the industry. 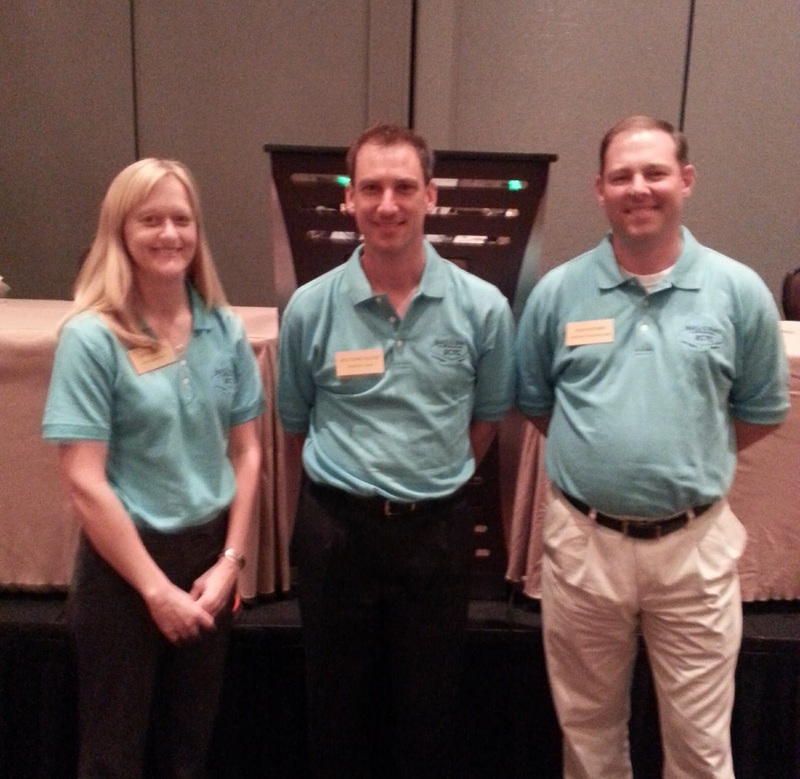 Key to this years conference success were Program Chair Beth Keser from Qualcomm, General Chair Wolfgang Sauter from IBM, and Assistant Program Chair Alan Huffman from RTI Int. Awards are an important part of this yearly conference and the pre-imminent packaging award is IEEE CPMT’s (Component, Packaging and Manufacturing Technology Society) “Field Award” Past years winners include Rao Tummala (packaging), Yutaka Tsukada (underfilling), Paul Totta (bumping); Herb Reichl (packaging); George Harman (wire bonding), Dimitri Grabbe (connectors) and CP Wong (polymers). 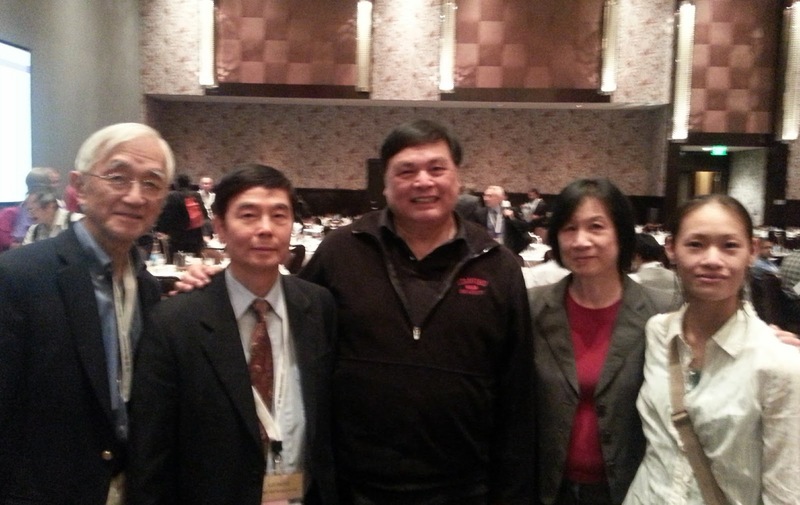 This years winner Is Dr. John Lau, currently a Fellow at ITRI. Best known for his extensive work in solder joint reliability, anyone who has a few packaging books on their bookshelf probably has one of Johns. 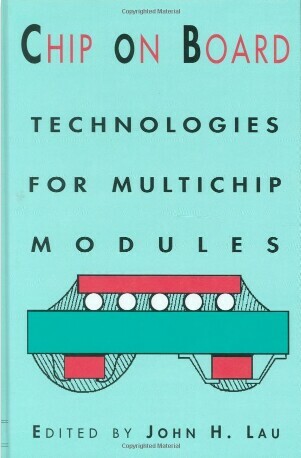 One of my personal favorites is his chip on Board volume published in the 1990’s. If I am remembering correctly, John once told me that his daughter Judy designed the cover. Without question the leading theme at this years conference was once again 3DIC. I counted at least 12 sessions and numerous posters that dealt with the various components of 2.5 and 3D technology. There were no major commercial announcements or major technology advances in 3DIC. Presentations tended to show slow steady movement forward for both 3D and advanced packaging in general. Over the next few weeks we will discuss this further and will take a look at some of the more interesting presentations at this years ECTC. You are currently browsing the Insights From Leading Edge blog archives for June, 2013.